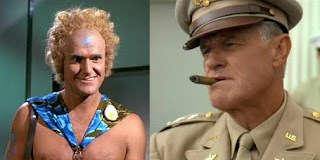 You probably won't recognise the name Charles Napier too quickly as he wasn't particularly famous for it, but because of his voice, his face and the square-jawed tough guys and military types he played in many movies and TV shows, he will be remembered forever - even if only as "that guy!" Napier was born in Scottsville, Kentucky, served in 11th Airborne Division and studied teaching before becoming an actor. He made his film debut in Cherry, Harry & Raquel! in 1970. Among his more memorable movie roles were Murdock, the intelligence officer in Rambo: First Blood Part II and Lt. Boyle in Silence of the Lambs. 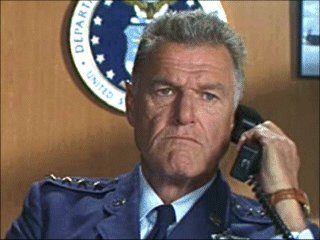 Less serious roles included Loaded Weapon 1 and as generals in the first two Austin Powers movies. His role as Judge Garnett in Philadelphia was described [by those who saw his whole performance] as "career defining" but sadly much if it was cut for running time. Napier was just as recognised for his numerous television appearances. 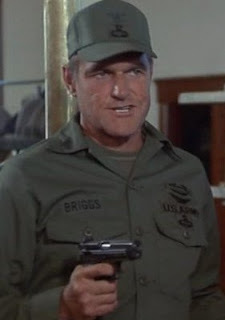 He guest starred dozens of TV shows like Mission: Impossible, The Incredible Hulk, The Rockford Files and Knight Rider. He also did two episodes of The A-Team. His most memorable TV work is of course the role of Adam the "space hippie" in the Star Trek: The Original Series episode "The Way to Eden". 25 years later he returned to Star Trek to portray Lt. General Rex Denning in the Star Trek: Deep Space Nine episode "Little Green Men". Napier's voice is instantly recognisable. He voiced many of The Incredible Hulk's growls in the '70's has also provided several guest voices for episodes of The Simpsons. Fans of the animated Superman series in the late 90's and later The Justice League will know his voice as General Hardcastle. 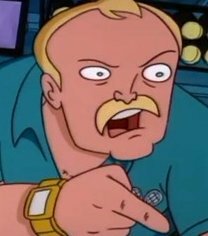 His greatest voice work in my opinion however is as the Ted Turner-esque media mogul Duke Phillips in the 1990's animated series The Critic. Napier was married twice and had three children. He collapsed in his home on Monday and was found the following morning and taken to Memorial Hospital in Bakersfield, California. He was taken off life support just before 1pm EST on Wednesday and died shortly thereafter. He was 75.